I just turned a ten page paper in, and I have never felt more free in my life. For the past couple of weeks, final exams and this impending paper have been hanging over my head, and to finally be done is one of the best feelings! I took a couple of college classes last year (my senior year of high school), so I have had a "finals week," but they were through my high school, and we were eased into it by having our teacher's help us through every step. I figured I had already had a couple of college finals, so it really wouldn't be too bad, but boy was I wrong! Now, being in college, my professors gave me a study guide, and essentially just wished us good luck. Dead week was something that I was definitely not prepared for, but at least I had my friends who had never gone through it either. In order to make it out of dead week - and finals - with my mind intact, I did a couple of things that really helped! Sleep can be hard to come by during dead week and finals week - so get it whenever you can! I took a couple of study-break-naps so my mind could be fresh for another couple of hours of studying. When your grades are on the line, it's a lot easier to stay awake and study, even when it means you'll get a lot less sleep. 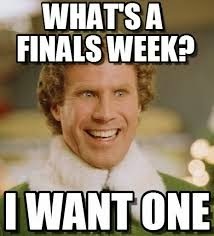 This is the case especially when you have multiple finals! Even if you and your friends aren't studying for the same class, it can be beneficial to study together, because you force each other to stay on track. This is also very helpful because you don't feel so bored and trapped in one place, and when you all want to take a short study break, you can just talk and hang out for a couple of minutes! They say an empty stomach means an empty brain, and it's very true! When you're hungry, all you can focus on is how much you want to eat, and it's harder to retain information. Make sure the snacks are healthy, though, in order to give your body the most nutrients possible - nuts, fruits, or vegetables are good options (edamame, carrots, and apples are my personal favorite!). It's a good idea to take short study breaks throughout multiple hours of studying. In order to keep your mind from getting absolutely fried, allow yourself a couple of minutes to focus on something other than what you are studying. I find that this helps me come back and focus on the material I'm studying, so I don't get bored with it and I can refocus after each break with a fresh mind. I drank a lot of coffee throughout both dead week and finals week in order to wake me up after a particularly long night. I love drinking coffee in general, though, so it was a nice excuse to have even more during these weeks! It will be one of the biggest reliefs of your term once you are done with finals - so go celebrate! Get some frozen yogurt with some friends, or simply have some well-earned down time and watch a movie or read a book. Usually after finals, you get some sort of break (yay, Christmas break right now!) so enjoy the time off, because you deserve it for studying so hard! 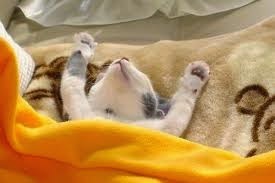 This will be me tonight since I'm officially done with finals and turning in papers! How do you study for big tests? Also, just a side note: I think now that I am on Christmas break, and have a lot of free time for a month, I will be starting Blogmas! I know I'm about a week late, but better late than never, right? I'm super excited to be able to devote all of my time to my blog this month, and hopefully you guys enjoy my December posts! :) So, technically, this is Blogmas Day 1! Thanks! :) Yeah, I'm really excited to have started with Blogmas even if it's late!